Tripp Lite's line of AC power cords offer PC users a solution to their power connectivity problems. This 4.57 m (15-ft.) cable will replace the power cable on most computers and peripherals that have a removable power cord. Cable features an AC style plug (NEMA 5-15P) on one end and a computer style receptacle (IEC-320-C13) on the other end. UL Listed. 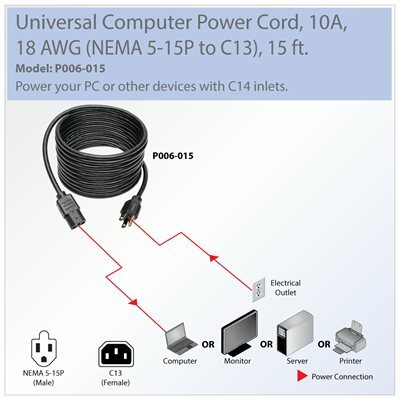 Use Tripp Lite’s P006-015 Universal Computer Power Cord to power computers and peripherals with C14 inputs, such as monitors and printers. Featuring a NEMA 5-15P connector on one end and a C13 connector on the other, this 15-foot cable provides a reliable power connection from a standard wall outlet to your computer equipment. Connect the C13 receptacle to your device and plug the 5-15P connector into a wall outlet. The P006-015 is manufactured using superior materials for reliable performance. The high-quality connectors are molded for durability and feature integral strain relief that gives the cord extra flexibility, reduces stress, and helps the cord and connectors move freely without cracking. This SJT power cord has three 18 AWG conductors and a 10-amp rating. The P006-015 comes with a lifetime warranty. It’s manufactured in compliance with strict RoHS specifications, reflecting Tripp Lite’s commitment to environmental responsibility.